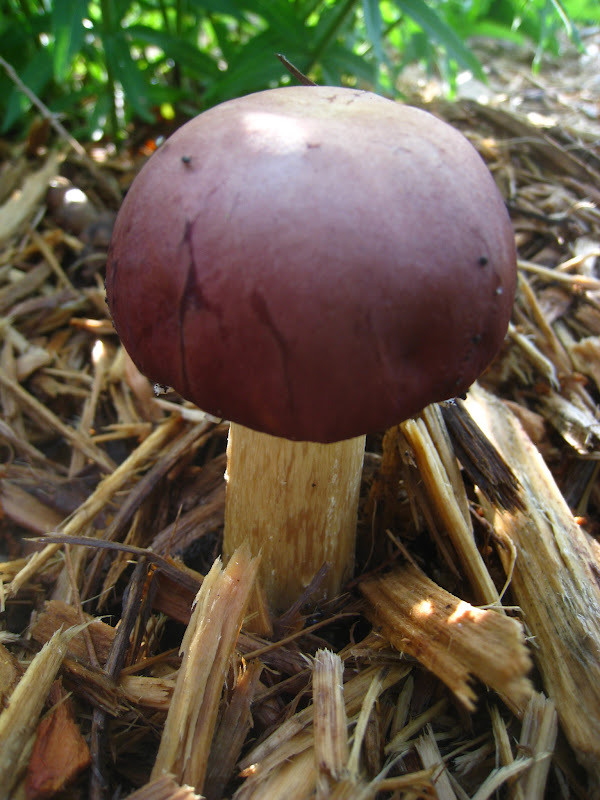 A distinctive mushroom commonly found in wood chips with the following features when fresh: large stature, wine-red cap, thick veil covering the gills. 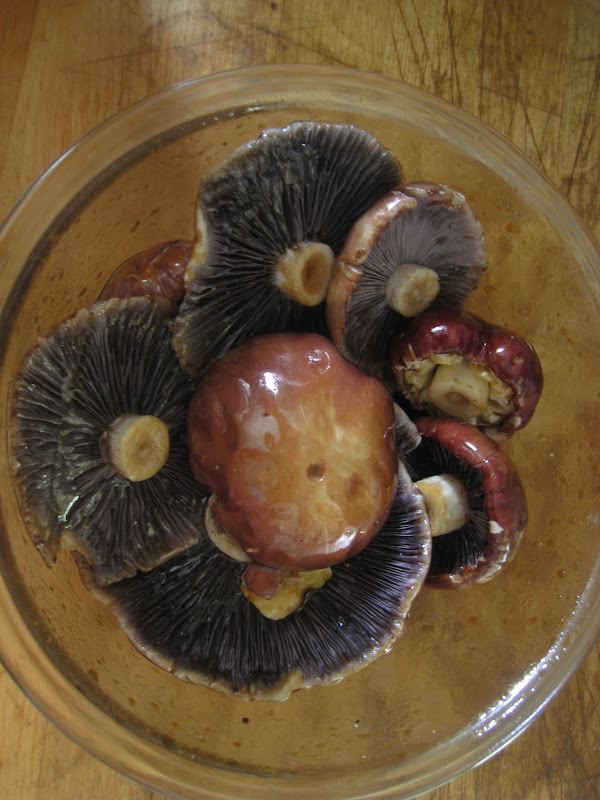 As it develops, the cap fades to a reddish-tan, the veil forms a thick ring on the stalk, revealing the purplish-grey gills. These two are past their prime, the caps well faded and expanded. 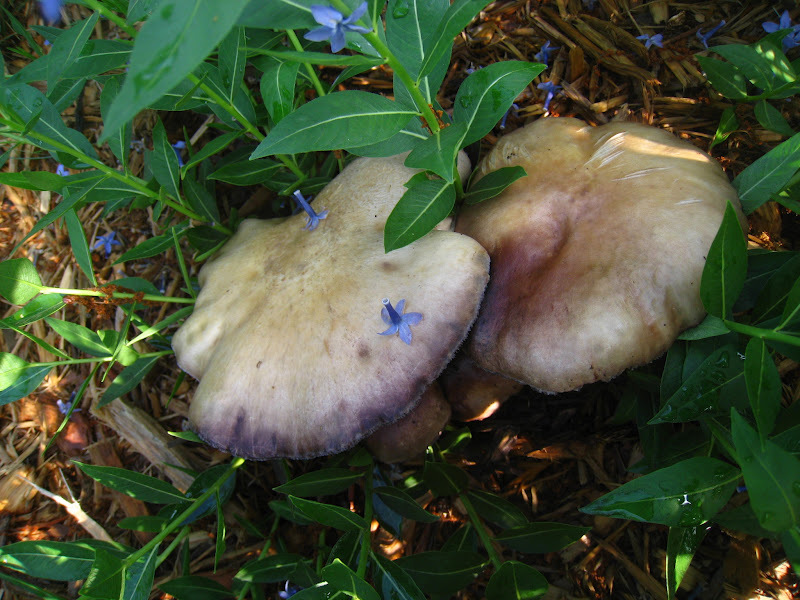 The Wine-cap Stropharia is a good edible, and pretty easy to identify. In my opinion, it's best when the cap is still unexpanded, otherwise the texture gets to soggy. Naomi and I collected about a dozen and carried them back to our car in my hat. At home i cleaned them up, cut off the stems and marinated them with soy sauce, sesame oil, rice vinegar, garlic, ginger powder, and pepper. 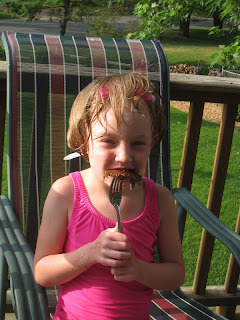 Later in the day they were grilled by my dad. 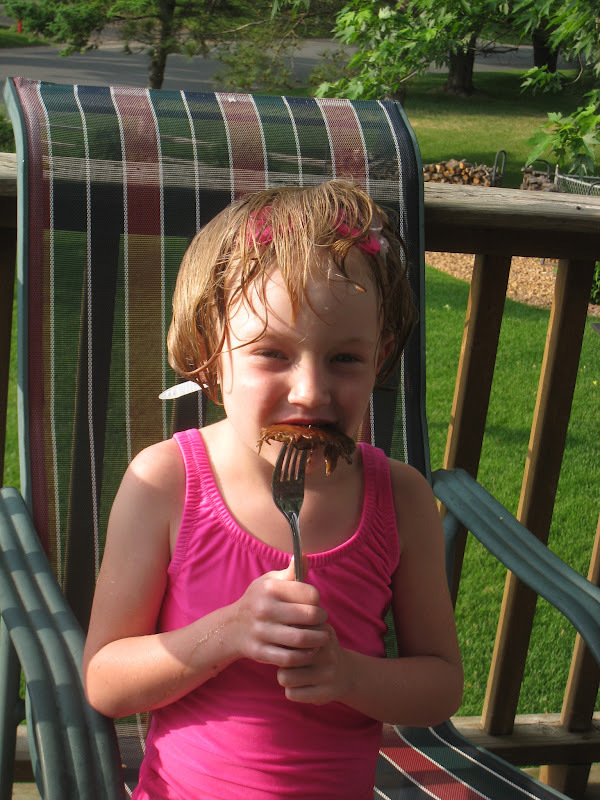 They were sampled by about a half dozen people, and the overall verdict was that they were quite tasty. 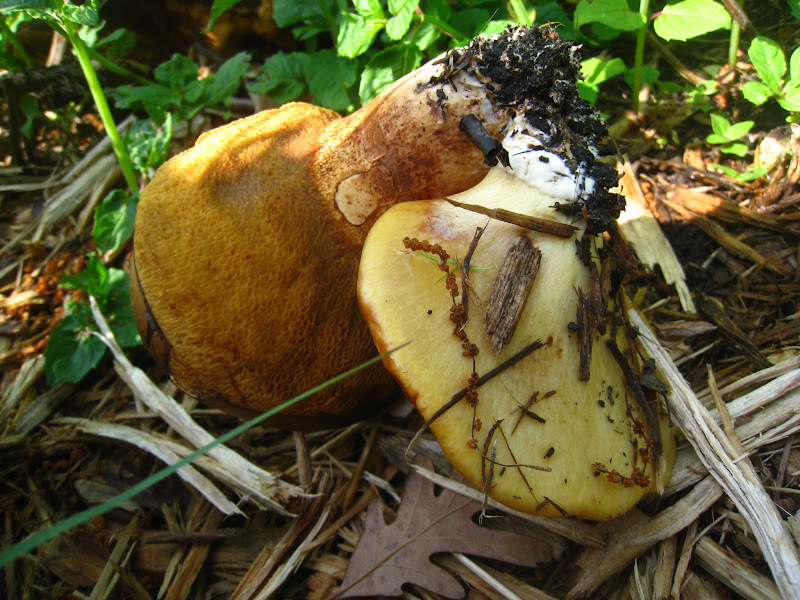 A pretty common mushroom found throughout the warmer months that grows from decaying wood (the wood is sometimes buried, giving the mushroom a terrestrial appearance). When it is fresh the cap is covered with shiny flecks, that wear off with age. 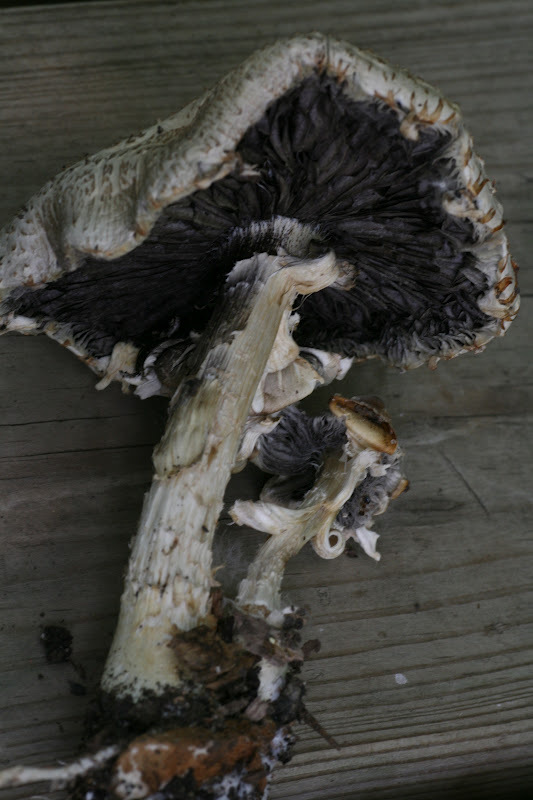 It is a coprinoid, or inky cap mushroom, but they don't seem to dissolve into black "ink" as much as some others. Featured in a post from last June. 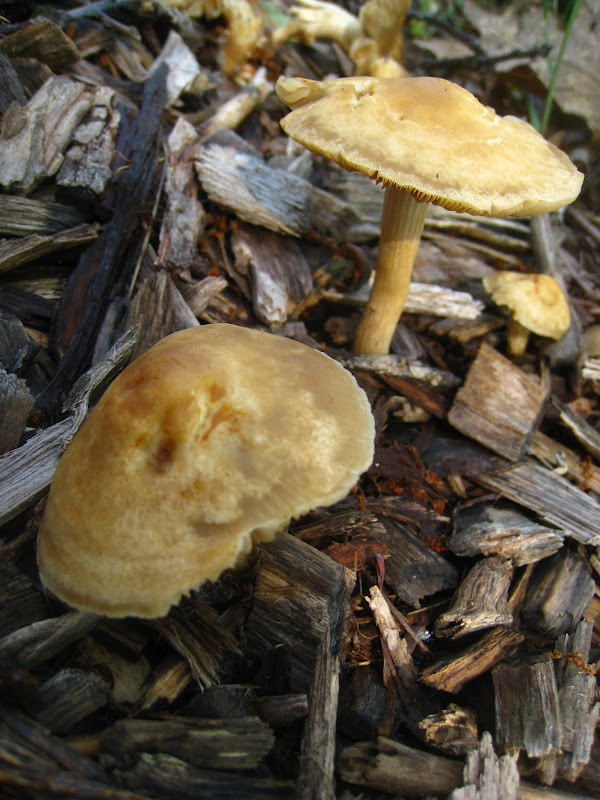 Possibly Stropharia kauffmanii. Note the scaly cap, growth in wood chips . . .
Fleshy ring on the scaly stalk, purplish-black gills . . .
and in the above photo you can see the dark purple spores that accumulated on the stalk above the ring. My mushroom was lighter in color than what was described, but it was also pretty dried up and probably not fresh.